The Yamaaizuri is the color of a cloth dyed with dyed plant indigo soybeans and grayish blue green. Yamaai ‘s rubbing dyeing is an old dyeing technique in which one sentence “Yamaai Mochi Sureru Kinu Kite” is also found in “Manyoshu”. However, it faded quickly, and indigo dyeing using Tadeai started spreading after the Heian period, and it gradually disappeared. However, it is transmitted as a dyeing of shrine clothing which is still carried out in the Imperial Palace, and the pattern of “Omigoromo” used for Ninamesai is said to be dyed with Yamaai. The color of “Yamaaizuri” is sometimes referred to as the oldest dyeing method by plants in Japan, and there is no record of dyeing color or dyeing technique, so it is not precisely known. Theory hue but has transmitted a “blue”, and that in the sliding-dyed leaves of Yamaai that does not include the indigo not only to green, from that of the “blue” at the time was a hue also contain green system, that’s green There is also. However, Yamaai’s stem and roots contain blue pigment that is different from indigo, so it can not be said completely “green” either. 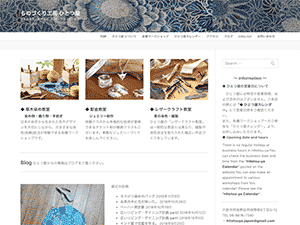 ※ The color sample of “Yamaaizuri” introduced on this page is based on Yamaai dyeing which Mr. “Tsujimura Kiichi” reproduced in Showa 51 years. 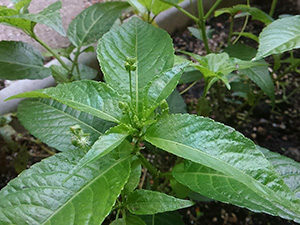 Yamaai is a perennial plant of the Euphorbiaceae. The height is about 40 cm and it is clustered in the mountains. The leaf which is birth has an elliptical shape and sprinkle green florets from spring to summer. Although it is the oldest dye plant which was regarded as a dyed dye in the Asuka period, unlike Tadeai of Todeiaceae and Ryukyuai of a foxtinaceae family, it does not contain indigo, so it is not suitable for dying dye like indigo dye . Unlike Tadeai who came naturally to Japan since long ago, Yamaai is used as a shrine even now as an ancient Japanese dyestuff plant, and has been cherished. The color of “Yamaaizuri” dyed with such Yamaai may also be called “sacred color”.